I've really been into pot pies lately. I've made Pizza Pot Pies and Spaghetti and Meatball Pot Pies - both were great! This time we are doing Taco Pot Pies! Cut 4 circles of dough about one inch larger than ramekin or bowl. In a large skillet, brown the hamburger meat. Drain fat and return meat to skillet. Add taco seasoning and water. Simmer for 5 minutes. Spray ramekins with cooking spray. Place 1 slices of Cheddar in each ramekin. 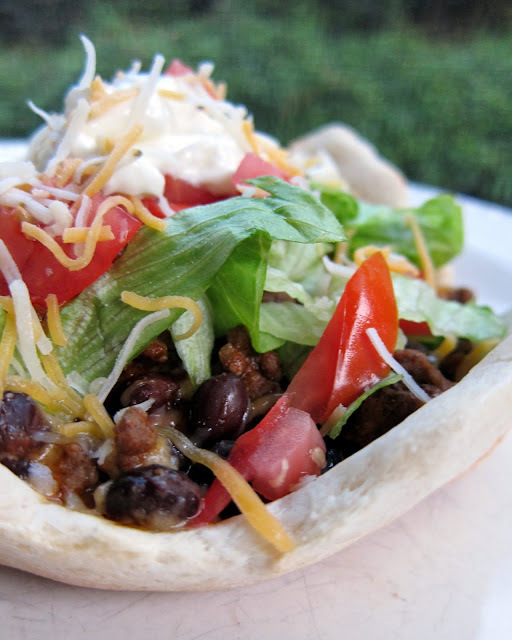 Divide taco meat between ramekins. Top taco meat in each ramekin with 2-3 Tbsp of black beans and finally with 2 Tbsp of salsa. Spray the outside of the ramekin with cooking spray, then stretch a round of dough across the top and let hang over the edge. Okay... I had to think there for a second, but I see now. You make it with crust on top, then flip & voila... the bowl is on bottom. Love this idea! I live in West Texas where the Tex-Mex food abounds and this looks amazing. I have always used flour or corn tortillas but this pizza dough sounds great. Thanks! Wondering if I could make a good pizza dough using masa so it would taste like a corn tortilla. I guess it doesn't really matter but mozzarella is not in the ingredient list. The recipe sounds very tasty. Should be cheddar - I fixed it. Thanks! Enjoy!